Merit Sensor Systems, Inc., a leading designer, developer and manufacturer of pressure sensing solutions, announced here today at the Medical Design and Manufacturing Conference (exhibiting at Booth #1901), its BP Series of medical pressure sensors. These devices have been designed to provide a form, fit and function solution to existing applications and fully conform to the American Association of Medical Instrumentation (AAMI) Standard BP22. They employ Merit’s proprietary Silicon Microelectromechanical Systems (MEMS) technology and exploit all of its benefits, including low-cost, item-to-item reproducibility and ruggedness. The BP Series operates over the pressure measurement range of -30 to +300 mm Hg and is compatible in air, gas and liquid, including blood. Being designed for large volume applications, the BP Series sensors are also compatible with automated assembly equipment. The design, assembly, manufacturing and testing of these devices are conducted under one roof at Merit Sensor’s Salt Lake City, Utah, U.S., facility. The BP Series was designed for disposable blood pressure monitoring but is also applicable in a broad range of additional medical measurement applications, including kidney dialysis and infusion pumps. The performance and reliability of the BP Series far exceeds the requirements of the AAMI BP22 standard. It operates over a pressure range of -30 to +300 mm Hg over the temperature range of +15 to +40 °C. The typical accuracy of the sensor is better than 1% of reading over this entire pressure and temperature range. The sensor is also able to maintain this level of accuracy over a wide supply voltage of 1-10 volts. These small devices measure 8.1 x 10.5 mm, weigh 2 grams and are suitable for ETO sterilization. The Merit Sensor BP Series Blood Pressure Sensor is available from stock. The unit price is $1.50 in 100,000 piece quantities. ABOUT MERIT SENSOR SYSTEMS, INC. 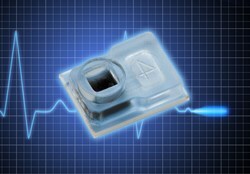 Merit Sensor Systems, Inc., was founded in 1991 and is engaged in the design, fabrication, assembly and packaging of customized piezoresistive pressure sensor solutions for medical, automotive, industrial, aviation, defense and consumer applications. Merit Sensor Systems is located in Salt Lake City, Utah, and is a subsidiary of Merit Medical Systems, Inc.